The 2005 Solitaire du Figaro champion crossed the finish line Dún Laoghaire not only to win the second leg but take the overall lead in the four-stage sailing race. Nicolas Lunven, the 2009 champion was second with Adrien Hardy, who won the stage to Ireland in 2010, third. Morgan Lagravière, was top rookie in 6th. The first of the four British sailors, Phil Sharp, was 23rd, just over an hour behind the leader. The pewter grey skies cleared briefly to let some bright sun through to spotlight the first Figaro on the horizon and reveal the breakaway leader of the 46 solo sailors competing on the second of four legs that make up La Solitaire du Figaro race. The second leg, 440 miles from Caen to Dún Laoghaire close to Dublin on the East coast of Ireland, set off last Sunday and took just over 65 hours for the winner to complete. Jérémie Beyou (BPI), blew his spinnaker in the shifty breeze just a couple of miles from the finish, but had been surfing downwind at a blistering average of 14 knots, whilst keeping a close eye on his pursuers as he helmed his boat to victory at 10:15 in the morning. 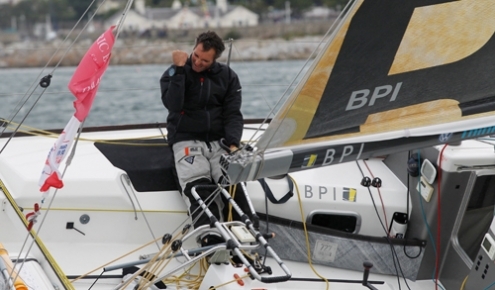 The successful and experienced French solo sailor, averaged 6.7 knots over the 65 hours and 25 minutes and 16 seconds. He was both jubilant and exhausted upon arrival. Nicolas Lunven sailing on Generali from France was just under 20 minutes later in second place with Adrien Hardy on Agir Recouvrement finishing third a further 18 minutes astern. Members of the National Yacht Club, international visiting media, and support shore crew welcomed the skippers on the arrival pontoon with champagne to celebrate. Rookie, or first time participant to complete the gruelling race was Morgan Lagravière in an impressive 6th. The four British entries, was headed by Phil Sharp on Spirit of Independence in 23rd, just over an hour behind the leader then Nigel King (E-Line Orthodontics) in 32nd, Sam Goodchild, the youngest skipper at just 21, Sam Goodchild was 33rd in Artemis, and Conrad Humphreys (DMS) in 40th just over two hours behind the winner. Francisco Lobato on Roff, who comes from Portugal, finished in 28th place. The race was really tough and the conditions, with upwind sailing though squalls, strong tidal currents and rocky channels at the start, were truly demanding. But the adrenaline rush come back for the downwind overnight reach up the Irish Sea to the finish. All 46 competitors remain in Dún Laoghaire Harbour until the start of leg three on Sunday 14th of August: 475 miles from Dublin to Les Sables d’Olonne in France.